Glucocorticoid hormone is a steroidal hormone. It releases from zona fasciculata layer of adrenal cortex of the adrenal gland. Glucocorticoid hormone is steroidal in nature. 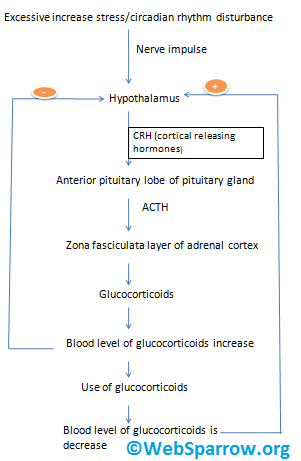 A release of glucocorticoid hormone is controlled by the hypothalamus. There are following natural glucocorticoids. There are following synthetic glucocorticoids. 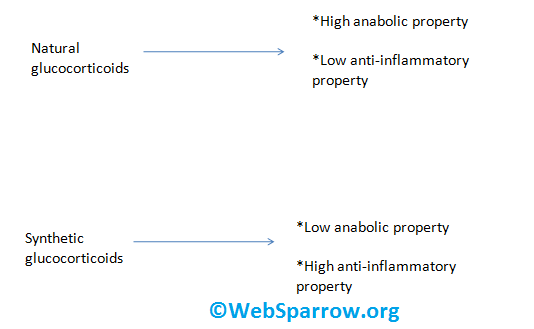 Note: Synthetic glucocorticoids having more anti-inflametory activity the anabolic activity of natural glucocorticoids. Glucocorticoids have a following pharmacological action. Glucocorticoid hormone increases the gluconeogenesis (formation of glucose) process. Glucocorticoid hormone helps to increase lypogenesis (formation of lipids) process, proliferation and distribution of fat in the body. 3- Glucocorticoid is also involved in the protein synthesis process. 4- It helps to enhance the production of ATP. 6- It is a anti-inflammatory in nature and also helpful for the balance of electrolyte & water balance. Hyposecreation- Hyposecreation of glucocorticoids cause Addission diseases and they are the followings. Hypersecreation- Hypersecreation of cause cushing syndrome. Cushing syndrome- increases the deposition of fat on the face, neck, abdominal & hip region.